At the time of reporting last night, Mr Salmond, who was kicked out as an MP in last year’s election, had raised more than £83,000. His appeal to the public comes despite being entitled to five pensions including as a former First Minister, MP and Member of the Scottish Parliament (MSP). On top of that he is paid by Vladimir Putin’s state sponsored TV channel Russia Today to present a weekly show. Scottish Conservative MSP Annie Wells also said: “Alex Salmond has taken the decision to resign his membership of the SNP, but he has some brass neck to publicly crowd fund in the same breath. “There is something deeply unsettling about an independently wealthy man asking ordinary people for money so he can take the government of Scotland to court for investigating allegations of sexual harassment against staff. 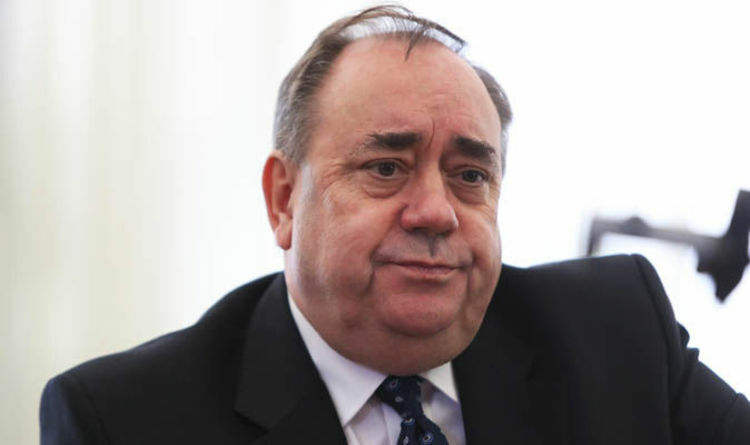 Mr Salmond wants a judicial review into an investigation that he sexually harassed a Scottish Government employee while he was First Minister. It was clear last night that his successor and protégé Nicola Sturgeon was embarrassed by his actions. She tweeted a link to a crowd funding site for a charity which deals with domestic abuse in what was taken as a slap down for Mr Salmond’s appeal. But Western Isles SNP MP Angus MacNeil was one of several senior figures to back Mr Salmond encouraging followers on Twitter to support his fundraising efforts as the Nationalists appeared to be on the verge of civil war. And the party’s women’s and equalities convener Tasmina Ahmed Sheikh, a former MP who produces Mr Salmond’s RT program, also retweeted him on Twitter and failed to back Ms Sturgeon.